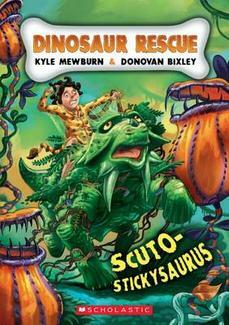 Scuto-stickysaurus is the latest book in Kyle Mewburn and Donovan Bixley’s disgusting and hilarious Dinosaur Rescue series. Each book gives me my dose of prehistoric facts, disgusting dinosaur behaviour and wild adventures with Arg the brainy cave boy. You can read my review here. Did you know there is an awesome new Dinosaur Rescue website? Head to www.dinosaur-rescue.com to have a look at all the interesting information and cool activities. Thanks to Scholastic New Zealand I have a Dinosaur Rescue prize pack to give away, including a copy of Scuto-stickysaurus and 2 other Dinosaur Rescue books . To get in the draw all you have to do is enter your name and email address in the form below, and tell me 2 things that you can find at www.dinosaur-rescue.com. Competition closes Wednesday 28 November (NZ only). Thanks to everyone who entered. The winner is Annette. I want to thank Donovan Bixley for just being alive! The world is a richer because of it!! I have just managed at last to buy a copy of Faithfully Mozart – this is a true work of art! Thank you so much for all your research, the very helpful time-line, and the whimsical re-imagining of Mozart’s world. Mozart of all musicians is such a healing influence. May your own four pearls accrue lustre…………………..faithfully, Jo M.